Tufano A, Cannavacciuolo F, Gianno A, Cerbone A, Mangiacapra S, Coppola A, et al. Inferior vena cava agenesis and deep vein thrombosis in the young: a review of the literature and local experience. Semin Thromb Hemost 2017;43:827–835. 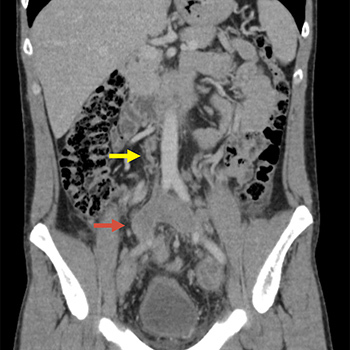 Milio G, Corrado E, Novo S, Licata G, Pinto A. Agenesis of the renal segment of inferior vena cava associated with venous stasis. Int Angiol 2010;29:385–388. Kola MK, Sandeep S, Vankayalapati SH, Reddy MS. Absent infra-renal inferior vena cava presenting with varicose veins. J Assoc Physicians India 2017;65:105–106. Menezes T, Haider EA, Al-Douri F, El-Khodary M, Al-Salmi I. Pelvic congestion syndrome due to agenesis of the infrarenal inferior vena cava. Radiol Case Rep 2019;14:36–40. Sagban TA, Grotemeyer D, Balzer KM, Tekath B, Pillny M, Grabitz K, et al. Surgical treatment for agenesis of the vena cava: a single-centre experience in 15 cases. Eur J Vasc Endovasc Surg 2010;40:241–245.